The GOMACO two-track Commander II is back and better then ever! New features include the G+ digital control system and a pivoting operator’s console for ultimate operator visibility. The Commander II, GOMACO’s two-track curb and gutter machine, is back and better than ever. The new Commander II introduction was announced at World of Concrete 2018. 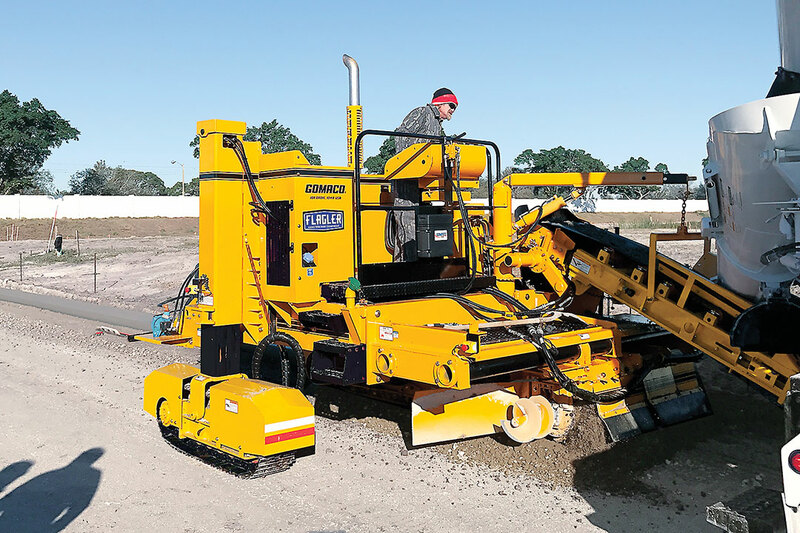 It features the simplicity of a two-track paver with GOMACO’s exclusive and operator-friendly G+® digital control system. There are GOMACO owners who prefer the Commander II over any other paver. It’s now back and features the new G+ technology. 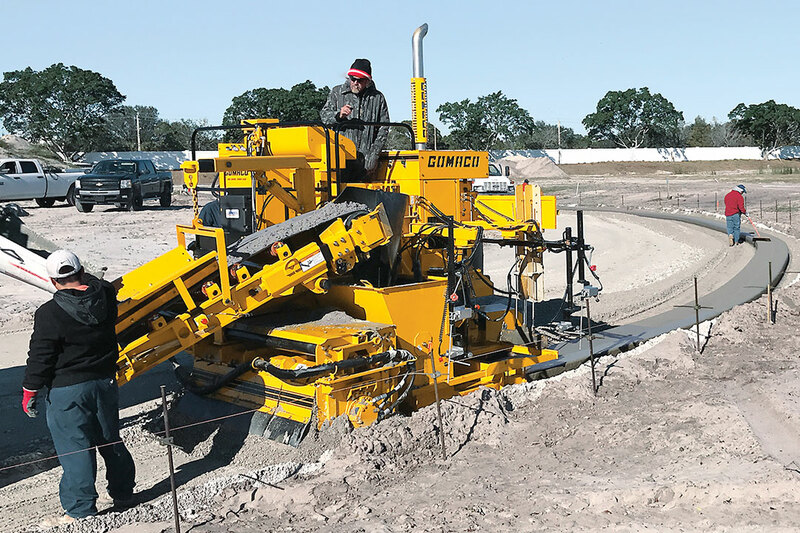 The first new Commander II was recently put to work by William D. Adeimy Inc. on a curb and gutter project at the Banyan Cay Resort & Golf in West Palm Beach, Florida. On its first day, the Commander II was slipforming over 40 feet (12.2 mpm) per minute, as logged by the GOMACO Remote Diagnostics (GRD) system. The Commander II took off right out of the box,” Tom Phillips, the GOMACO service representative who was on site to commission the paver, said. “I had to chase that thing all day! The contractor was unloading eight cubic yard (6.1 m3) trucks through the machine in nine minutes. Quality wasn’t compromised slipforming at that speed either. The Commander II was putting such a nice finish on the new 24 inch (610 mm) wide, 7.5 inch (191 mm) tall valley gutter, that only one finisher was required behind the machine. Operator comfort and visibility has been designed into the new Commander II. The operator’s platform is now isolated to eliminate vibration. A new pivoting operator’s control console allows the operator to have hands-on control and ultimate visibility no matter what application is being slipformed. G+ control allows independent track drive for the ultimate paver control experience. Concrete is fed into the hopper by a 20 inch (508 mm) wide, six foot (1.8 m) long conveyor belt. It features a belt speed of 350 feet per minute (106.7 mpm) to quickly move the concrete into the hopper. The Commander II is powered by a 102 horsepower (76 kW), Tier IV Kohler engine. It features a travel speed of up to 82 feet per minute (25 mpm) to quickly traverse any job site. It is equipped with a 60 inch (1524 mm) wide sectional direct drive trimmerhead for exacting grade preparation. The quality of the curb and gutter produced by the Commander II was so good, only one worker applying a broom finish was needed to work behind the new curb and gutter machine. The Commander II will slipform a variety of applications and is designed to simultaneously trim and pour for maximum concrete utilization. It can easily convert from project to project with applications such as curb and gutter, safety barrier, irrigation canal, recreational path, shoulders and more.